In 1999, when The Matrix was released, minds were blown. The idea that the world we lived in was a lie scared the crap out of people, especially with the approach of the new millennium. Eleven years later, you’d think we’ve moved on to something else to worry about. Nope. “Kult” tells the story of Tomaz Zenk, a reluctant hero who must take his place as the new controller of the machine that is the new world. However, instead of taking this task head on, Zenk flees. Yes, this is not the most heroic move ever, but give him a break. This creator free world is a scary one. There are monsters that you can only see in nightmares present, not only to mention anarchic hermit named Herzog. Also the lord of hell, Astaroth. That’s right, the lord of hell. With a title like that, you should probably be afraid. With all of this going on, you can now understand why Zenk backed off. It is only when his daughters are put into harms way that Zenk comes to the rescue. “Kult” is unique mixture of the classic stories we’ve read before. There’s super powers, super villains, damsels in distress in the eye of an apocalyptic storm. This chaos is equally balanced, so no one dynamic is too overwhelming. Each one of Iwan Nazif’s panels is chocked full of action and even a certain level of fear. This is brought out especially in the art. It’s classic look gives us that gritty feel we need to understand the environment that these characters live in. 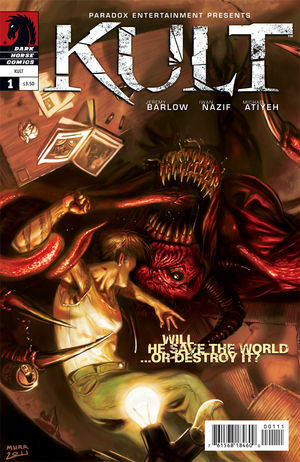 Kult is worth flipping through for any comic fan that needs a break from the ordinary.